Today I am starting #blogjune – a month of updating my blog every day for a month. I’m really looking forward to seeing what other bloggers come up with, and reading some thought provoking, witty and insightful stuff. I’m not sure if this post is any of these, but I am easing myself in slowly. May and June seem to be the months of birthdays, and as such, I find myself quite poor when it came to my Dad’s birthday today. Being notoriously hard to buy for anyway, a home made birthday cake seemed like a good way to at least acknowledge the day, and spend some time with him devouring it! Luckily, when I asked what type of cake he would like he opted for passionfruit, which I have been receiving weekly in our vegie box, so I was very happy to have a new way to incorporate passionfruit. 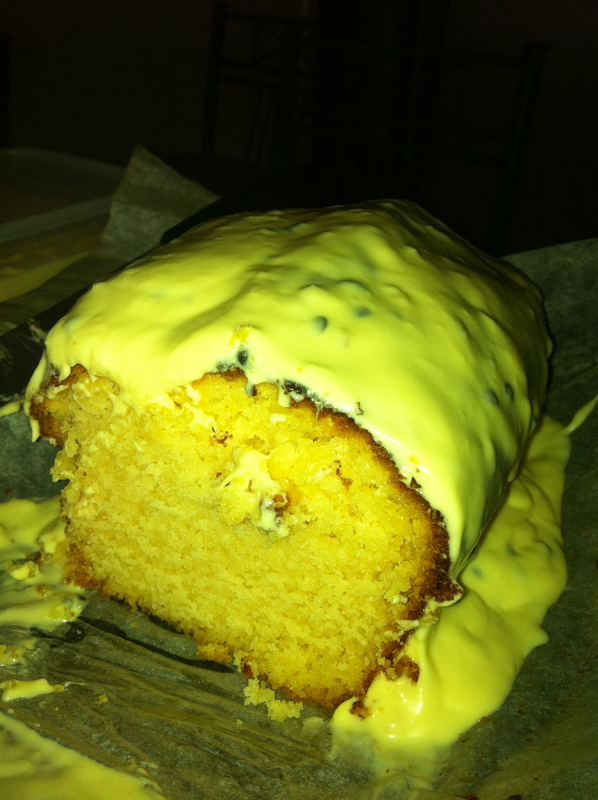 Here is what I came up with, to Dad’s specifications – a plain cake, with passionfruit icing. I ended up using two different recipes from Taste.com – one for the cake and one for the icing. 1. Wiz ingredients together until smooth. 1. Preheat oven to 175 degrees. Mix ingredients together, and pour into a loaf tin, lined with baking paper. Bake for 45-50 mins, or until centre is cooked through. 2. When the cake has cooled, ice with icing (obviously!) and refrigerate to set before serving with tea or coffee. Hopefully, you will end up with something that looks better than this, but tastes just as good!